Here’s a fantastic opportunity to win a Harvey Nichols Noel! Noel! Christmas hamper, worth £100, which will most definitely get you well set up for the festive season. The hamper itself is a sturdy wicker basket with smart leather buckles and hinges that in itself is quite a handsome thing, but the contents are spectacular, all sourced from Harvey Nichols’ gourmet range. It’s as if somebody has had a bit of a tour round the Fourth Floor food market with Christmas in mind and packed the fruits of their labour into a nice basket. The hamper has the obligatory bottle of red and white wine, a Marc de Champagne Christmas pudding, tea, coffee, a thick slice of chocolate and cherry pianoforte, jars of mint jelly, cranberry sauce and brandy butter, some sage and onion stuffing mix, spices for mulled wine, some Christmas spiced biscuits, a box of rather excellent marzipan fruits and a Harvey Nichols cotton bag. All you need to provide is a turkey. Everything is typically first-rate Harvey Nichols quality, packaged and presented beautifully. Harvey Nichols’ range of foods is consistently good, and their food halls are rich hunting grounds for those slightly out of the ordinary things you might need every now and again. It’s clear that a lot of care goes into sourcing and producing these goods, and it shows in the finished product. This is a great selection of Christmas-themed essentials, and yes, I’d argue strongly that pianoforte should become a British Christmas staple. Why not? It’s a lovely present, available from Harvey Nichols, either in store or online. Click here for more details. I’ve got one Noel! Noel! Hamper to give away, worth £100, so just fill in the form below to enter the draw. All you need to do is enter an email address in the Rafflecopter form below (not the normal Comments section), but you can earn extra entries by tweeting about the giveaway, liking them apples on Facebook, or following @them_apples or @HarveyNichols. Comments entered into the normal Comment section will not be counted as entries – only entries through the official Rafflecopter form immediately below are eligible. The draw will be open 12am on the 10th of December. The full terms and conditions of the draw are listed in the entry form below, but please note that this giveaway is only open to UK residents. The prize will not be shipped to any non-UK addresses. Lovely website and a lovely prize. Amazing – good luck everyone!! Brilliant Prize! followed & tweeted @Rainbow222 – I would be delighted if I was lucky enough to win this prize! Please enter me in the competition – fantastic prize! Please enter me in the competition – great prize! Thank you. Count me in, please!!!!! How marvellous! I would love to win,all done thanks. Wow i would love this! Love the harvey nics food section. Especially all the quirky hot sauces make fab stocking fillers!! Ooooh it could be me…. Can’t beat good old Harvey Nicks! Yum yum! great prize.Merry Christmas everyone. Looks good. Left email and tweeted. Would make a BEAUTIFUL present for my folks. Would make a BEAUTIFUL present, for my folks. 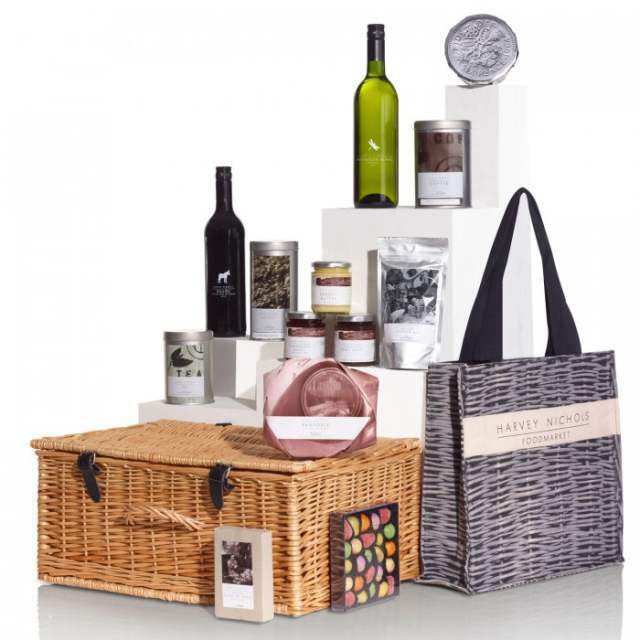 A lovely hamper for Christmas Day, – Harvey Nic’s – hip, hip, hooray!!!!! Fantastic prize. Would be great to win. What an amazing prize, would love to win this. What a lovely prize and just in time for Christmas!